10″ Partlow replacement paper for circular chart recorders. Fits Partlow Models MRC 4000, MRC 5000, MRC 7000, MRC 7700, MRC 7800. 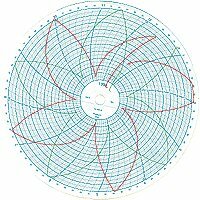 Fits other circular chart recorders requiring 10″ paper. 100 charts in a box.